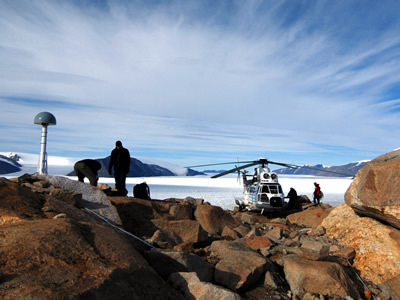 Nine continuous GPS stations were installed in Greenland during the August 2009 field campaign. Communications for two stations installed last year (2008) were repaired and brought back online. Data from these sites are transmitted via an Iridium modem to the Boulder Facility network, where it is archived automatically. Currently there are 43 stations in the GNET network. Figure 1 - GPS antenna with the Airlift Super Puma just up from the Hamburg Gletshcer. 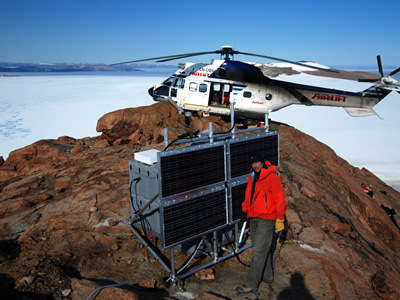 Figure 2 - Eric Kendrick in front of the Ymer Nunatak power system. The system is powered by four 80W solar panels twenty-four 100 amp/hr batteries.